Huawei has been teasing its P20 smartphone for the last couple of months, and the official announcement confirms many of the various leaks that preceded today's big reveal. The new model will be joined by a P20 Pro option, and it's this Pro version that will have particular appeal to photographers. That said, the company has already stated that both models beat their competitors according to DxOMark ratings. Both models share many commonalities, such as the same Android 8.1 Oreo OS with Huawei's EMUI skin on top. New features include "edgeless" fingerprint sensors, minimal notches on the top of each model, and both 3D portrait lighting and 3D facial adjustment effects on the inside. The pair differ in many ways with respect to their hardware, however, and perhaps the main point of difference is that the P20 Pro offers a triple-camera system on its rear, whereas the P20 sticks to a dual-camera setup here. The P20 Pro's setup uses separate 40MP RGB and 20MP monochrome sensors, together with an 8MP sensor that's fronted by a 3x telephoto lens. 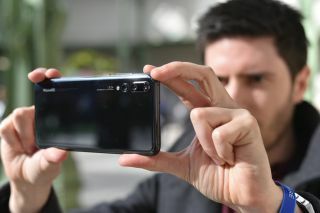 Huawei claims that, among other things, that the P20 Pro can capture a six-second long exposure and use its Huawei Artificial Image Stabilisation (AIS) to stabilise the image. This is in addition to a 24.8MP camera on the front, which is present on both models. Both models will come in a choice of Graphite Black, Midnight Blue, Twilight and Rose Pink finishes. Read more: Why do so many smartphones have two cameras on one side?